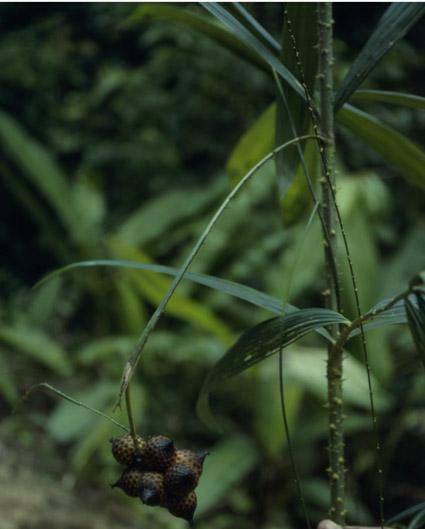 Slender clustering rattan climbing to 30 cm; stem without sheaths 5 mm in diameter with internodes to 25 cm; stem with sheaths 1.5 cm in diameter. Sheaths bright green with scattered yellowish black-tipped spines of varying length the largest to 1.5 cm long interspersed with much smaller spines to 1 mm long mostly ± horizontal. Knee present, rather small, ocrea very short. Flagellum to 1.25 m. Leaf to about 40 cm long sessile or with a very short petiole scarcely exceeding 3 cm long. No cirrus. 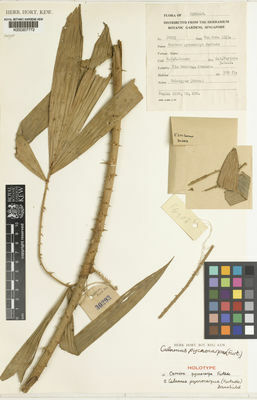 Leaflets 7 to 8 in number the uppermost four in a group with the 2 apical leaflets joined through up to Vs their length, with rachis continuing, spiny along underside, lower leaflets in a basal group separated by about 25 cm from upper; leaflets ± equal to 30 cm long by 3 cm wide, the lowermost usually somewhat narrower, all leaflets bristly at tip. Inflorescence very short, to 25 cm long, very rarely longer, with one partial inflorescence only, the axis continuing as a short flagellum beyond this; bracts sparsely to densely spiny; male partial inflorescence branched once only bearing densely crowded flowers to 6 mm long. 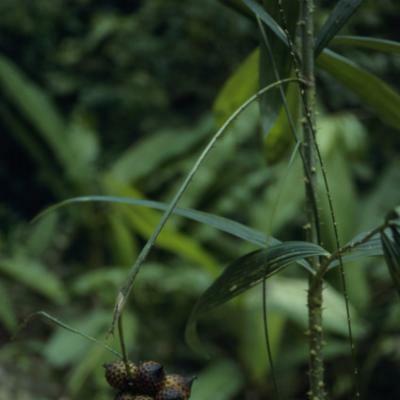 Female partial inflorescence spike-like or branched once. Female with densely crowded flowers. Ripe fruit to 2.2 cm long including conspicuous beak, by 1.5 cm wide elongate ovoid, covered in 14-18 vertical rows of dull chestnut brown scales with shiny black margins (whole fruit black scaly when young), with very faint groove. Seed angular; endosperm homogeneous. Seedling unknown.